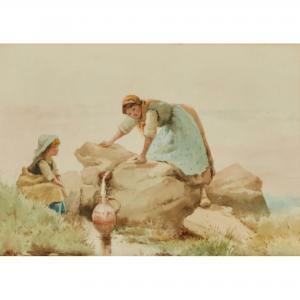 Find artworks, auction results, sale prices and pictures of Aubrey Ramus at auctions worldwide. 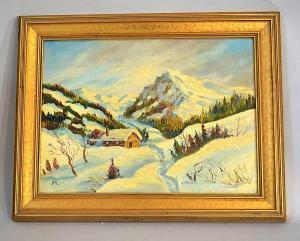 AUBREY RAMUS AKA FRANCIS JAMIESON (British 1895-1950) Three landscapes, oil on board, signed A. Ramus. Gallery labels: J.J. Gillespie, Pittsburgh. 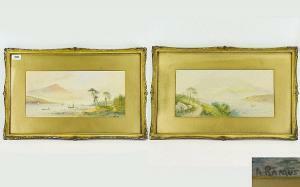 Contained in gilt frames. F.E. Jamieson painted under at least eleven different aliases to conceal his art from his employers. Condition: no visible defects. 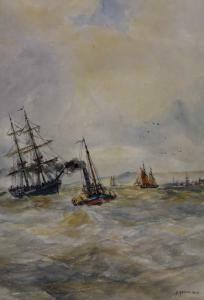 Description: Aubrey Ramus British Artist 1895 - 1950 Pair of Watercolours ' Italian Lake Scenes ' with Sailing Boats. Signed to Bottom Right. Paintings Size 8 x 16 Inches. Each Watercolour Mounted and Framed Behind Glass.